Yearbook sales are ongoing. 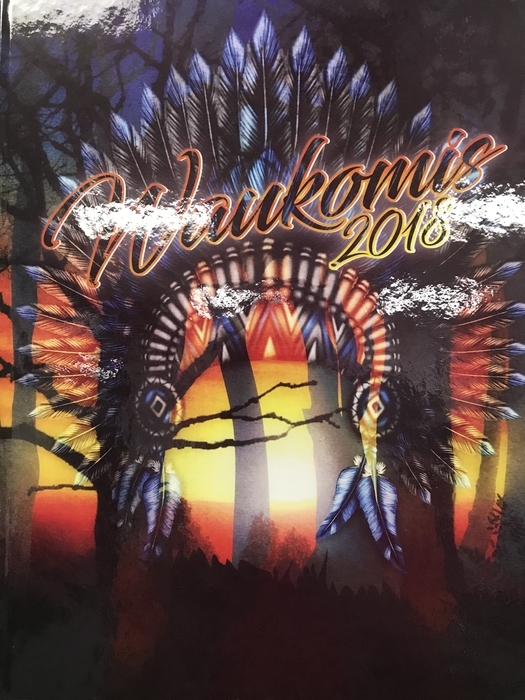 Purchases can be made through Waukomis Yearbook or online through Jostens web ordering at http://jostensyearbooks.com/?REF=A06955700. Sales will end May 10th, and there are a limited number of copies, so purchase yours today. SENIOR YEARBOOK ADS! 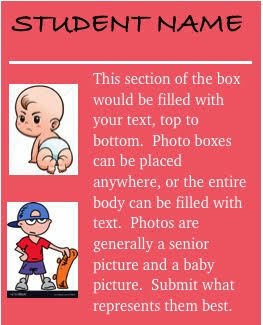 Yearbook wants to remind senior parents that Senior Ads are due. If you want to post a 1/4-page letter and a couple of photos, we need them ASAP. Ads are $45 for 1/4-page, discounted $20 below the business ad price.. 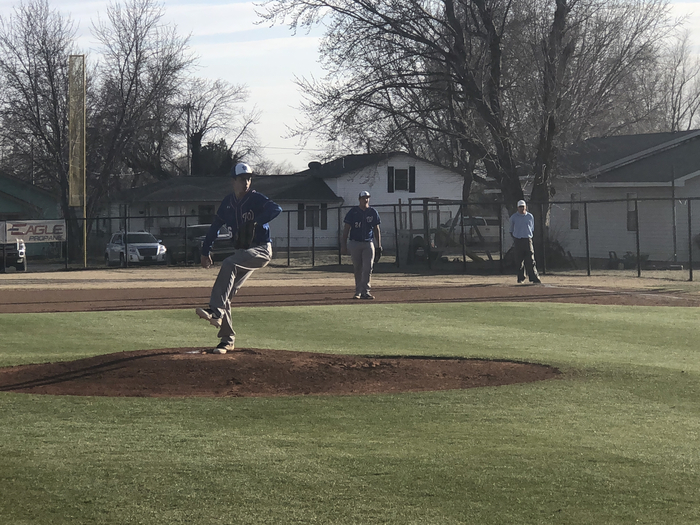 The Cimarron Softball Tournament for today has been postponed until Friday April 5th. This is a friendly reminder that school will begin at 8:10 starting March 25th. Have a great evening! Spring Picture Day is this Friday, March 15th. Yearbook sales are open. Don’t forget to buy yours. Send in your form or go to http://jostensyearbooks.com/?REF=A06955700 to order online. The JH softball game for today 3/12/19 against Geary has been canceled. The junior high and high school softball games for today (3/7/19) against Drummond has been canceled. The softball game for today against Covington-Douglas has been canceled. We will try to reschedule for a later date. The baseball game for today 3/1/19 against Dover has been cancelled. Spring Picture Day is March 15th! Packets will go home as soon as I receive them. Every spring athlete needs a packet filled out with name and sport on picture day. Cheer tryout clinic scheduled for this afternoon has been canceled due to inclement weather. Due to inclement weather conditions Waukomis Public Schools will be closed today February 27th. Have a great day and stay warm! REMINDER: Junior High & High School P/T Conferences are Thursday February 21st from 3:30pm-9:30pm. Please call the high school office to have yours scheduled. Yearbook sales have begun online and by order form. 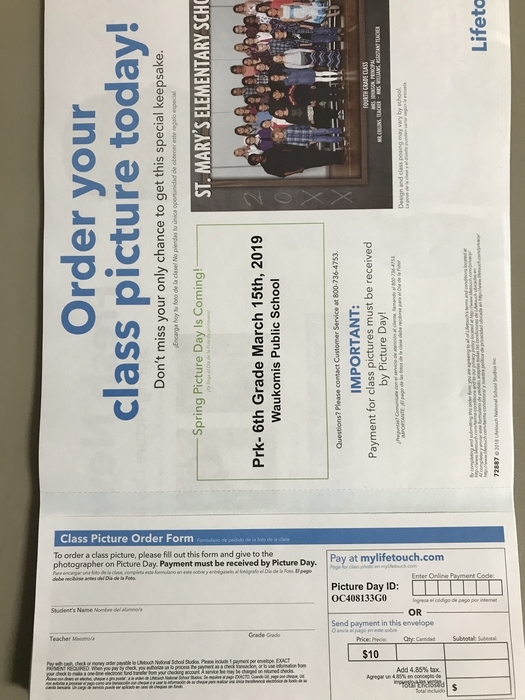 Forms will be sent home with students for ordering, or patrons can visit http://jostensyearbook.com/?REF=A06955700 to order yours at the lowest price of the year. Books are $30.00. Personalization with name, monogram, or crest can be added for $6.00. Up to four icons can be added for $3.50 each. 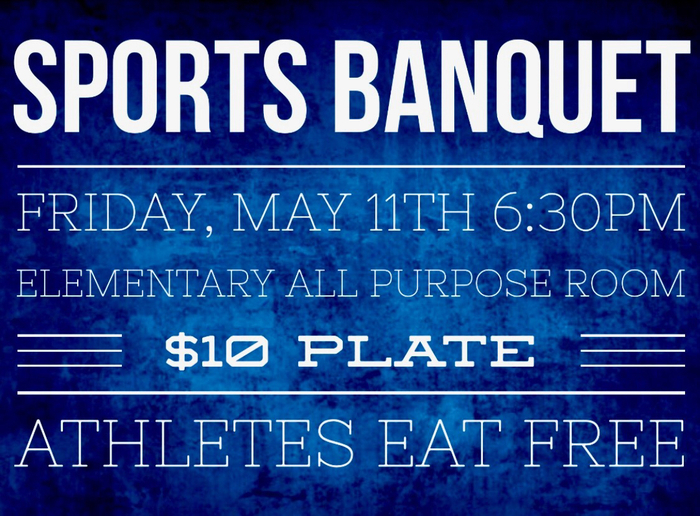 Contact Mr. Dykstra if you have any questions. 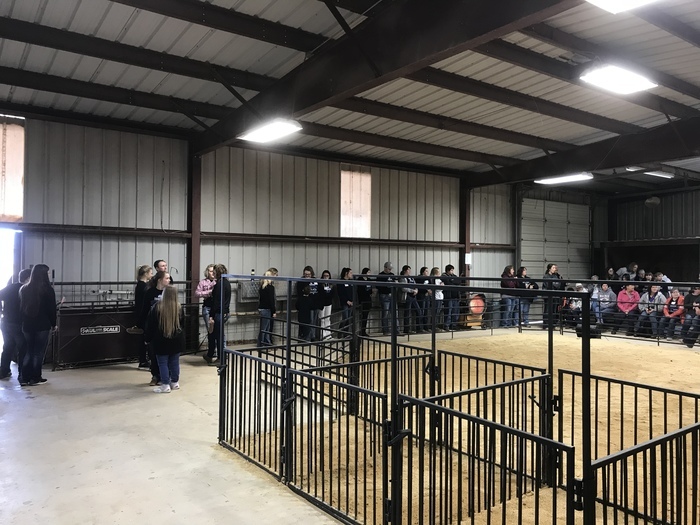 The 2nd annual Special Needs Livestock Show has been rescheduled for Tuesday Feb. 12th Starting at 10:00 am. 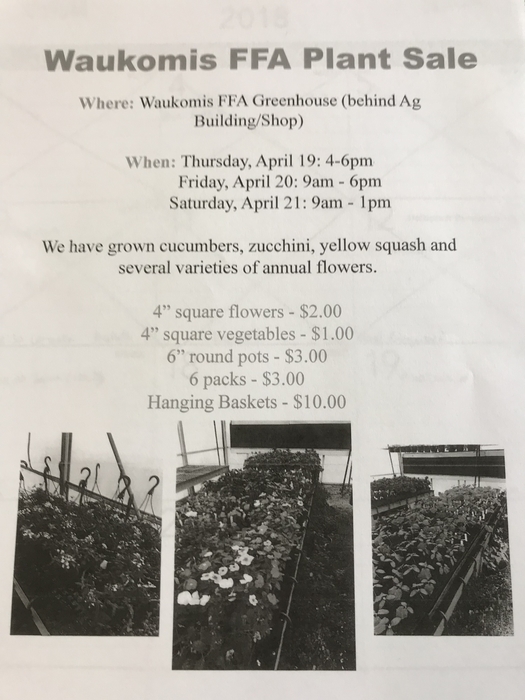 The show will be held in the Waukomis Show Barn. We hope to see you there! The Special Needs Livestock Show will be POSTPONED due to weather and extreme cold predicted for in the morning. We will announce new date as soon as we get it set. Due to the ice, cold weather, and flu Waukomis Schools will be closed today Thursday February 7th. Stay inside and it’s a great day to be a Chief! Reminder, there will be a Town Hall meeting to discuss the upcoming bond election. 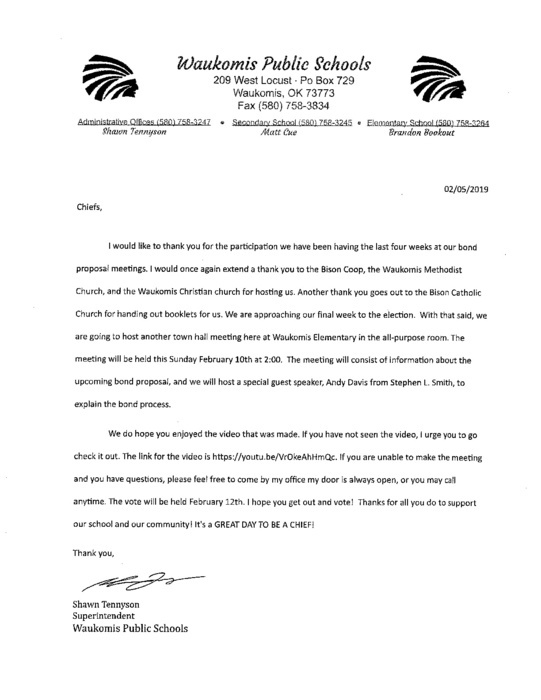 The meeting will be in the Elementary All Purpose room at 2:00 pm this Sunday, February 3rd. We hope to see you there. 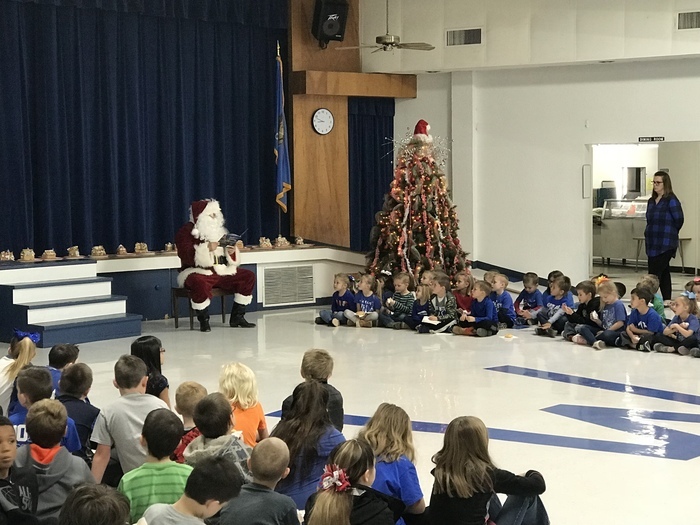 Parents and guardians this is a reminder that on Thursday December 20th the school day ends at 2:00pm. Have a very merry Christmas. 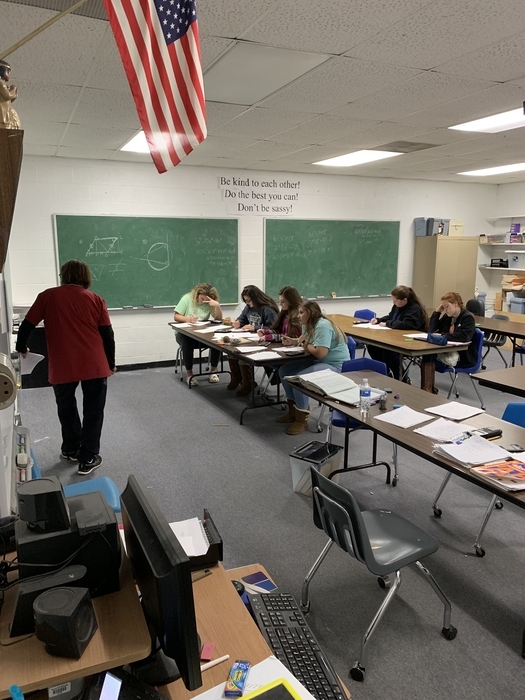 Thank you Mrs. Hampton for the great ACT Geometry review and for those students who took advantage of it. #gettingsmarter!! Picture Retake Day! November 28th. New students need to pick up an order form in the office. 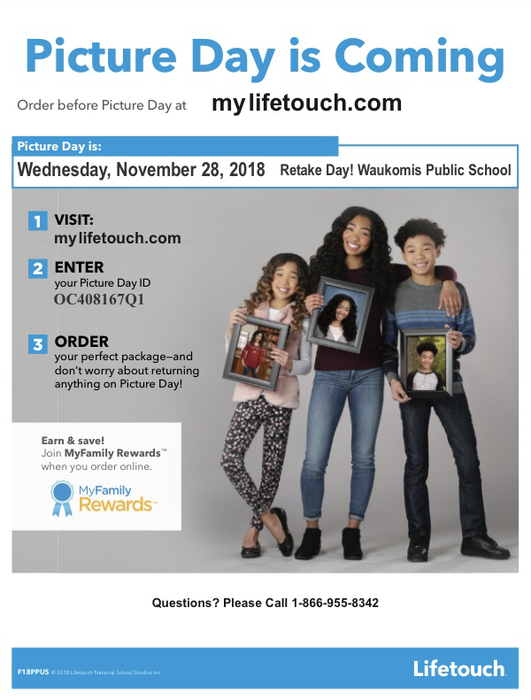 Those who want retakes must return the original portrait package to the photographer on picture day. Organization groups and winter sports will also be taken that day. Photography will be in the gymnasium. 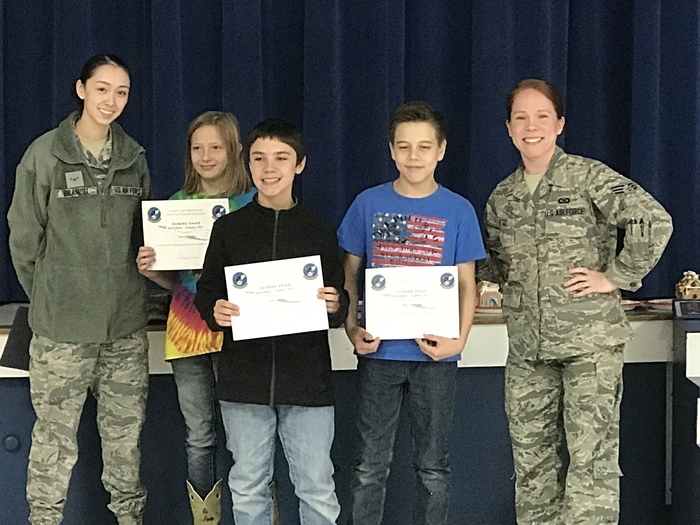 Congratulations to these kids on a successful Region Opening Ceremonies and Greenhand Contest!! Carlie Atchley placed 2nd in the Greenhand Quiz Contest and will be representing us at the STATE contest in Stillwater later this month!!! Because of standing water the home side parking will be closed for tomorrow's game. We will allow you to drop off your vehicle along the home side fence (ONLY) until noon tomorrow. After that we will lock the gate. Sorry for the inconvenience! Good afternoon Waukomis Chiefs! We would like to inform you that the grade school and junior high football games for tonight have been canceled because of weather. Congratulations to Slater Eck, Paige Robinette, and Lexi McNeill for making Tri-County all conference!! Also congratulations to Coach Pond for being named Tri-County Coach of the Year!!! Awesome job!! 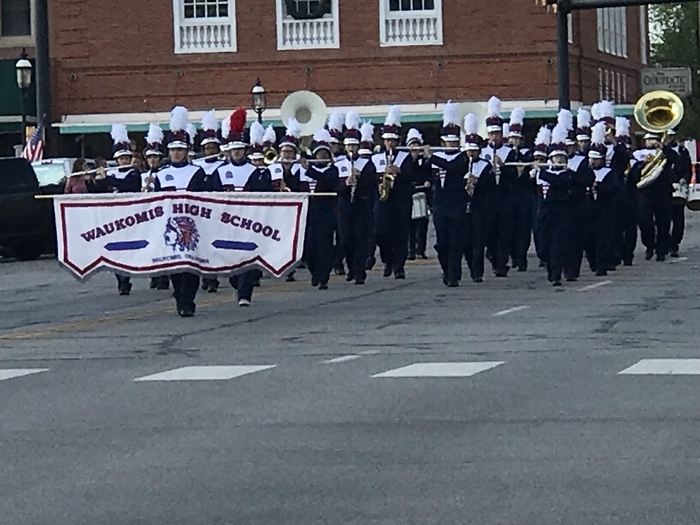 Congratulations to "THE PRIDE OF WAUKOMIS BAND" for receiving a superior rating at the Tri-State Marching contest in Enid!!! Great job!! 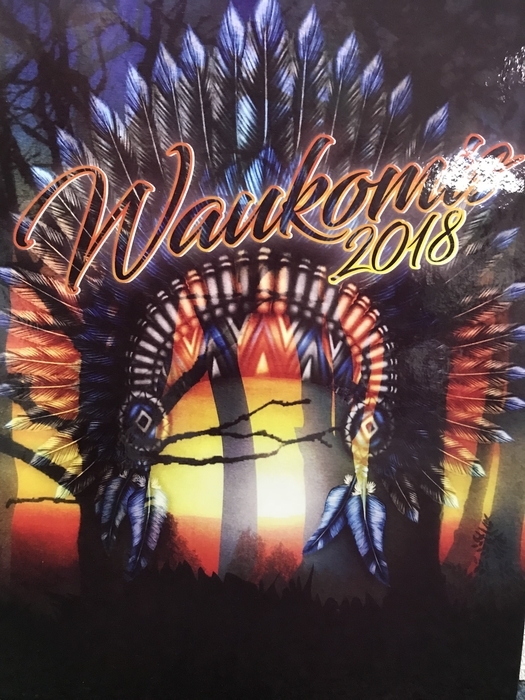 12 of the 2018 Waukomis Yearbooks still remain. Pricing is $30.00. 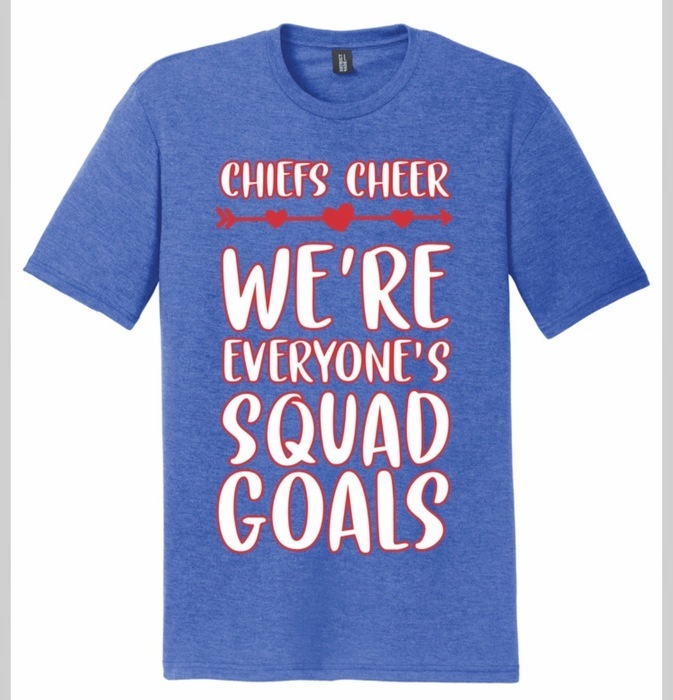 Contact Mr. Dykstra or the high school office to purchase yours today, while they are available. Good morning Chief Nation! If you plan on going to the Canton game this evening please be aware that highway 51 is closed. 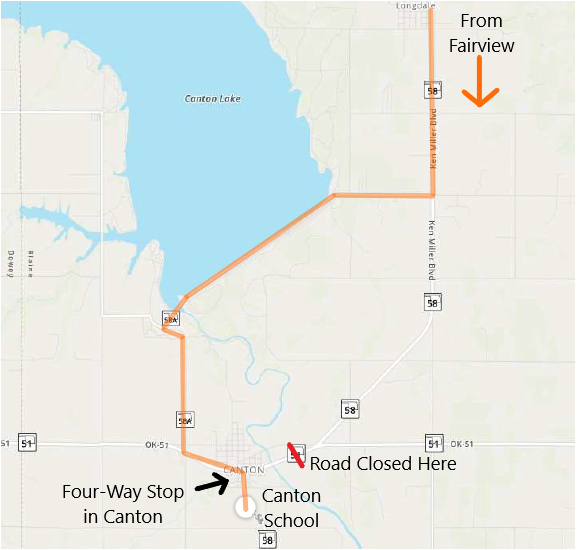 You will want to go through Fairview and go across Canton dam to get to Canton. It’s a great day to be a Chief! Good morning chief fans! Because of not enough players from Deer Creek, there will be no junior high football tonight. Grade school will still start at 5:30 PM and the bus will leave at 4:00 PM. 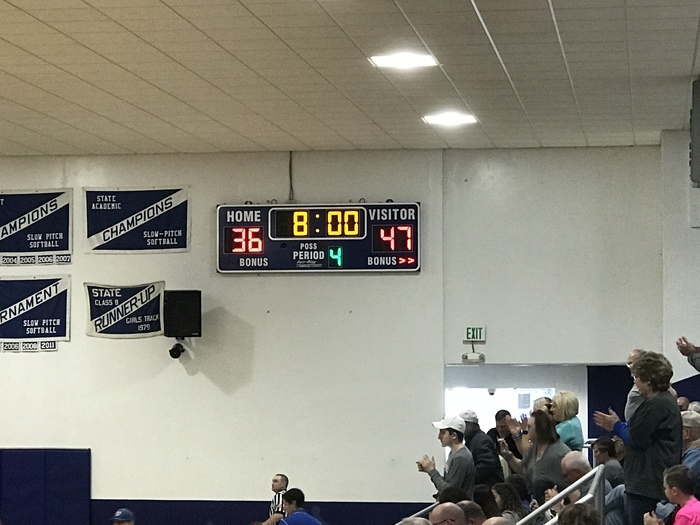 Congratulations Coach Pond and the Lady Chiefs! 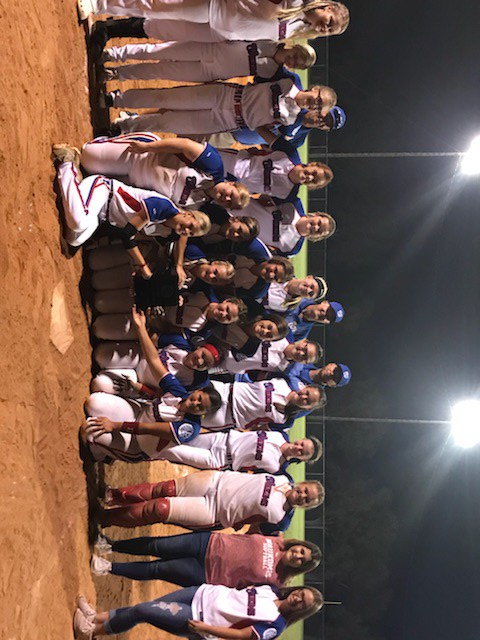 2018 Fast Pitch District Champions!!!! 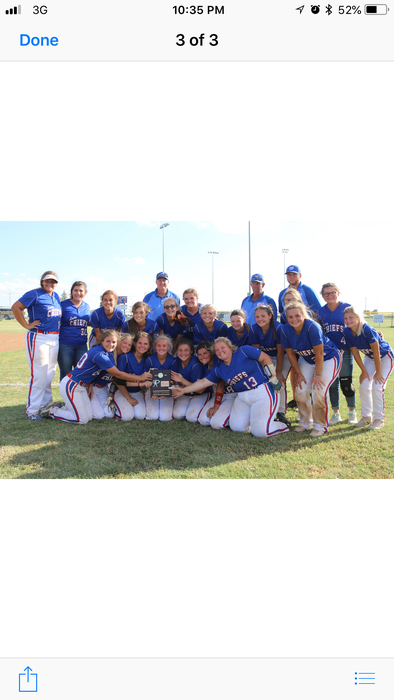 Because of the football game moving to Thursday the District Softball will now start at 9:30 AM with Garber against Oklahoma Bible Academy. 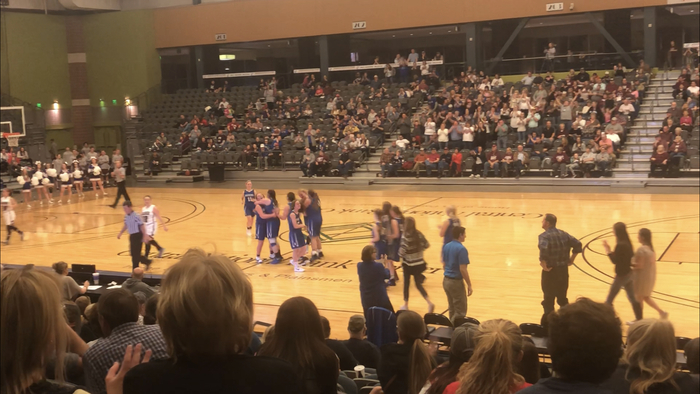 Waukomis will play the loser at 11:00 AM. Also the homecoming dress up days will be switched. Spirit day Thursday & Nerd vs Jock Friday. Because of possible severe weather on Friday, we are moving the football game against Wetumka to Thursday September 20th @ 7:00 PM. We will continue the crowning ceremony for Homecoming on Friday September 21st @ 6:15 PM in the school gymnasium followed by a dance @ 8:00 PM. I have 21 surplus yearbooks for sale at the high school, $30.00 each, first come, first served. PICTURE DAY IS COMING! Wednesday, September 19th. School-wide Individuals, Senior Portraits, and Fall Sports group and individual. 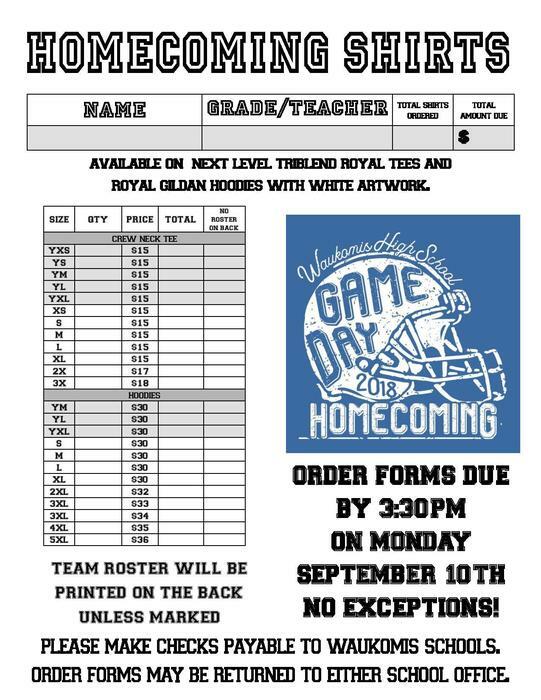 ​Don't forget to order YOUR 2018 FOOTBALL HOMECOMING SHIRT!! We hope everyone is having a great Labor Day weekend. We would just like to remind you that the elementary and jr high football teams kickoff tomorrow at Dean Lovell Field starting at 5:30. 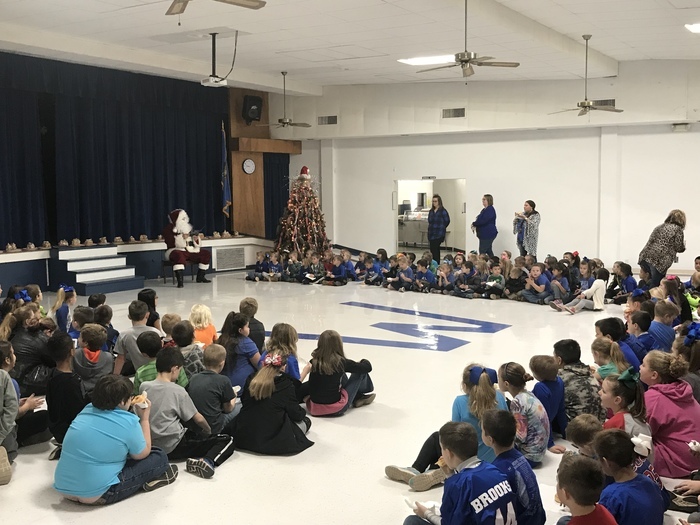 Jr High will follow the elementary game. 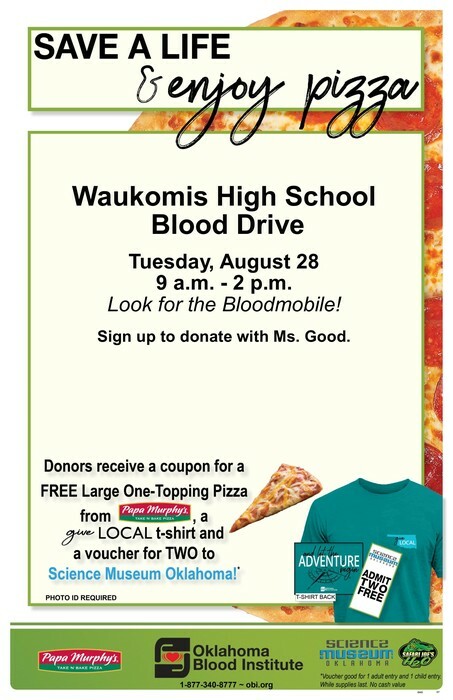 Waukomis High School Blood Drive Tuesday August 28th. 9:00 am - 2:00 pm Contact Ms. Good for more information. Waukomis Schools will have the dome open for the public to view this Saturday during Sooner Celebration day from 4 to 5. Please come by and check it out. It’s a great day to be a Chief! Congratulations to the lady chiefs softball team for making it to the Championship game once again!! 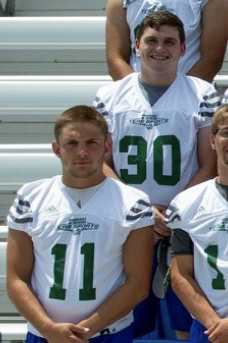 They play August 21st at Kellett Field 7:00 PM. Good Luck ladies!! Congratulations to Braden Heisler for being accepted to the National FFA Band!!! This is a huge honor and we couldn’t be more proud of him!!! He will play in the band at the National FFA Convention in October in Indianapolis!!! Just a reminder: the Waukomis United Methodist church is giving away school supplies on Sat. Aug. 11th from 9-11 am at the city Park . 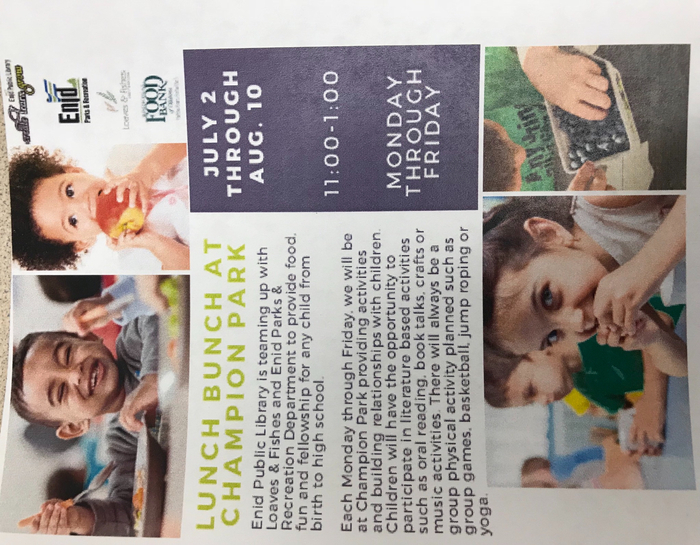 Come have lunch, play games, or just enjoy the music, and visit with friends. Parents of 9-11 grade students please remember our school if fortunate enough that we are moving to a one to one initiative. We require a $50.00 fee for the equipment use. We also require the technology agreement to be filled out. Chrome books will not be distributed to your students until these two actions are completed. A perfect time to accomplish this is during enrollment day. If there are any questions please contact the school. It’s a great day to be a Chief! Attention parents! There has been a change in time for sports physicals. They will now be at 8:30 August 2nd. Please download the proper paperwork from our website and have filled out when arriving for the physical. Sorry for the change and confusion. Have a great weekend! It’s a great day to be a Chief! 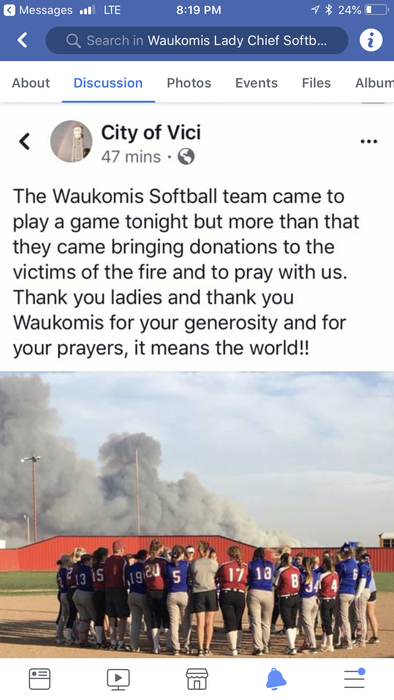 Parents and friends of Waukomis Football. The Football staff has put together a work day this Friday morning stating at 6 and also this Saturday morning starting at 7. They are asking for any and all help. Help needed ranges from scrapping paint, painting, fence mending, welding work, torching work, moving items etc. Please come out and help us get ready for another exciting year of CHIEF football. Thank you in advance and it’s a great day to be a CHIEF! 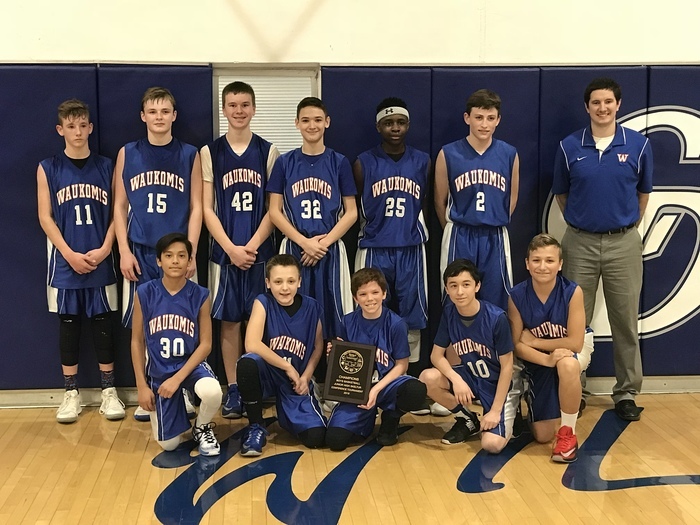 Waukomis Schools has partnered with Dr. Ferrell to provide sports and bus physicals. They will be held August 2nd starting at 1:30 in the High School. There will be no charge. The only requirement is to have paperwork filled out signed and ready to go. You can get paperwork from the website. It’s a great day to be a Chief! All girls entering the 7th-12th grade in 2018-2019 and are interested in playing softball need to come to a parent/player meeting on June 29th @ 6:00 PM in the gym. Congratulations to the HS Chief band. They made a superior today at the Tri State competition!!! Its a great day to be a chief!!! "SO MANY MEMORIES SO FEW YEARBOOKS Yearbooks are going fast, and supplies are limited. Order now for $30.00 before they're completely gone. School is almost out on May 17th, and the deadline to order is quickly approaching. 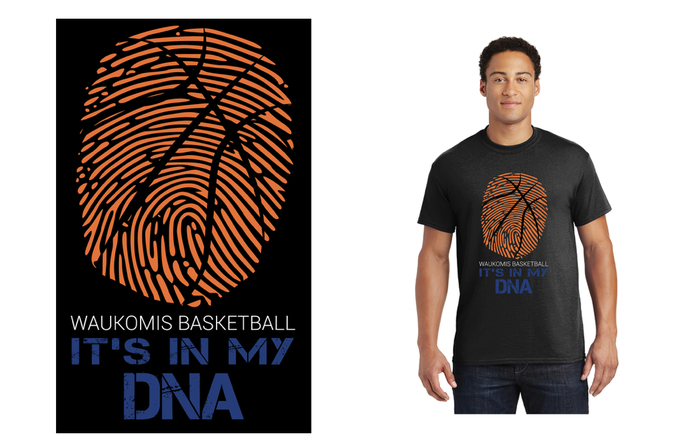 Get your orders in to Mr. Dykstra now, or go to http://jostensyearbooks.com/?REF=A06955700 and place your order online. *Checks should be payable to Waukomis Yearbook." 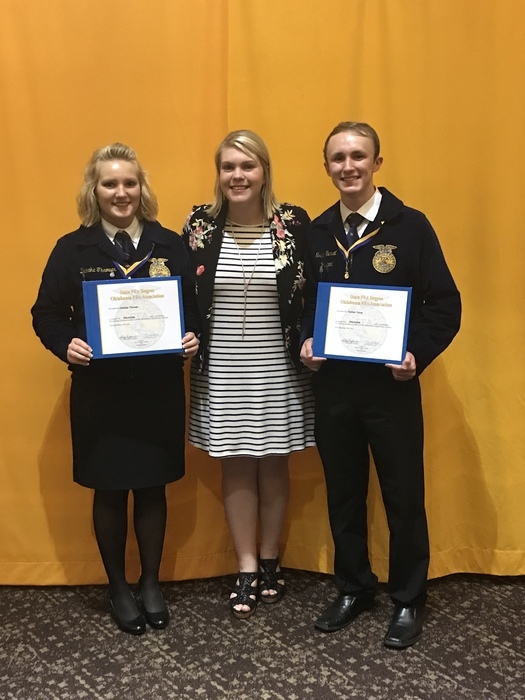 Congratulations to the 2018 Waukomis State FFA Degree recipients Trenton Terrel & Danaka Thrower. Covington-Douglas: The 5/6 grade track meet for Wednesday is being moved to Thursday due to forecasted weather. 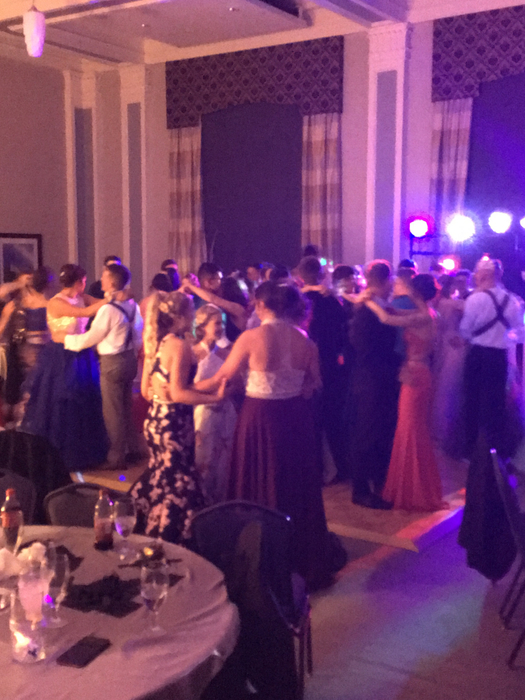 2018 Waukomis Prom! Its nice to see these kiddos all dressed up and having fun!! Its a great day to be a Chief! 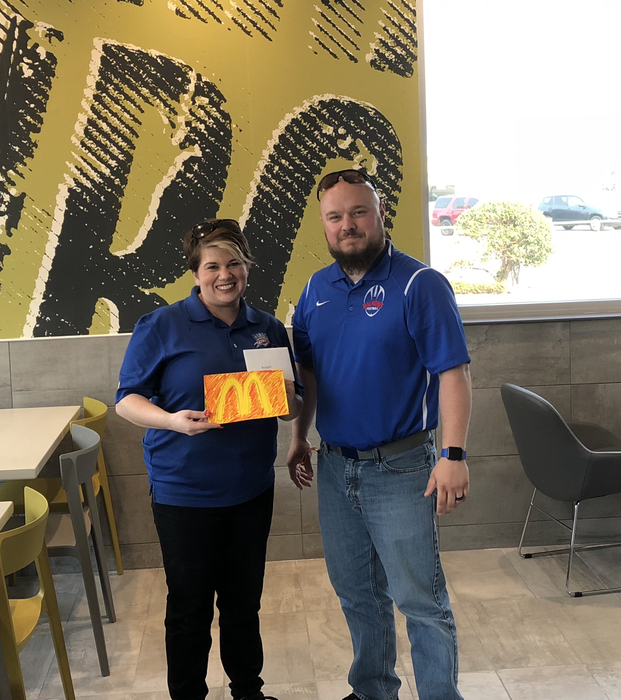 Thank you Heather and the McDonald’s team for providing breakfast to our testers this week! Waukomis, hope your weekend is going great! Waukomis schools will return to class Monday April 9th. 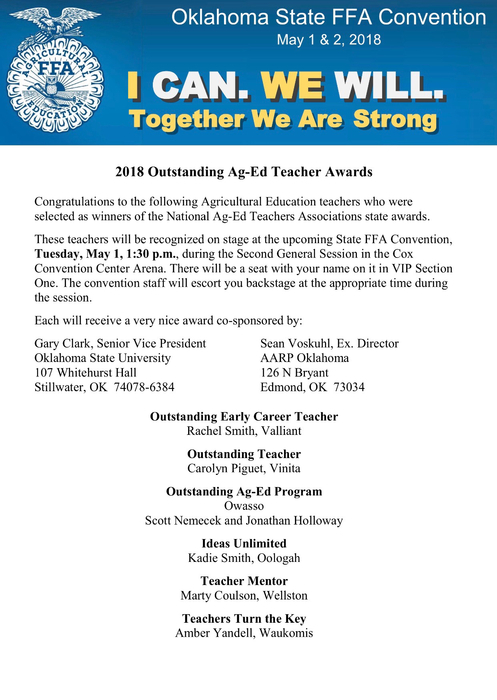 We will be sending 10% of our teaching staff to the capitol to represent us. 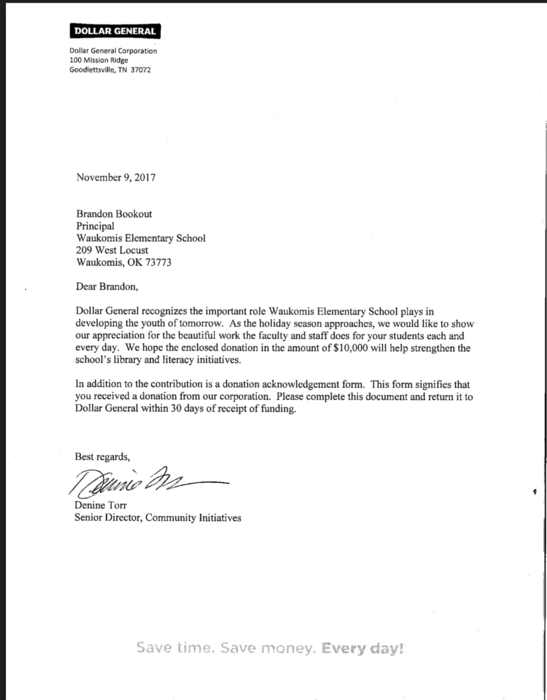 We would like to invite any community members to go down with our representatives to help represent Waukomis School. We would like to thank you for your continued support, and we hope that you will join in with going down to the capitol with our teachers. It’s a great day to be a Chief! 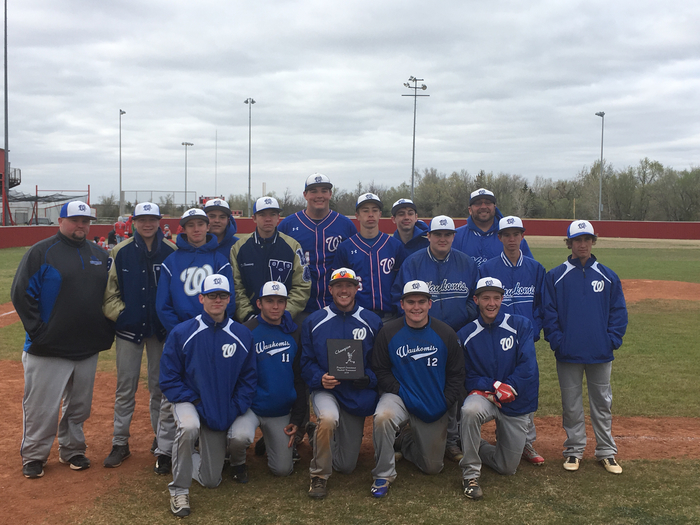 Due to weather the Jr high Pioneer Baseball tournament has been canceled for this weekend. 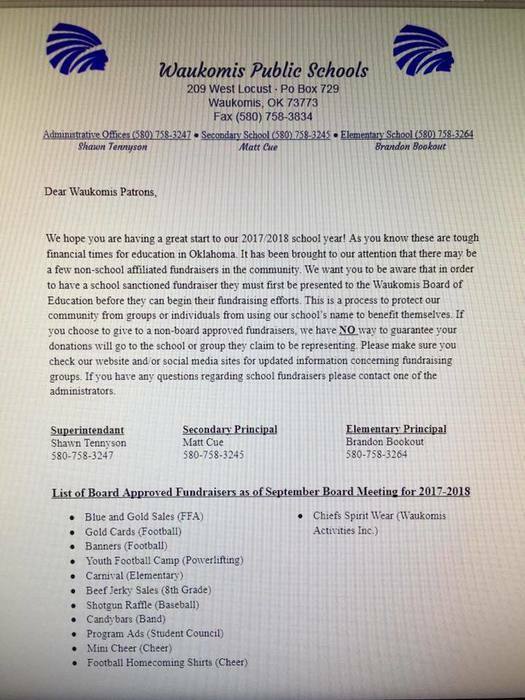 Good evening from Waukomis Public Schools. School will be out for the rest of this week in support of the teachers rallying at the capital for the students of Waukomis Public Schools future. Picture day will be rescheduled and we will let everyone know the new date as soon as possible. We will start making up days missed with our Fridays that we currently have out. We would like to thank the juniors for the hard work they put in today with the ACT. 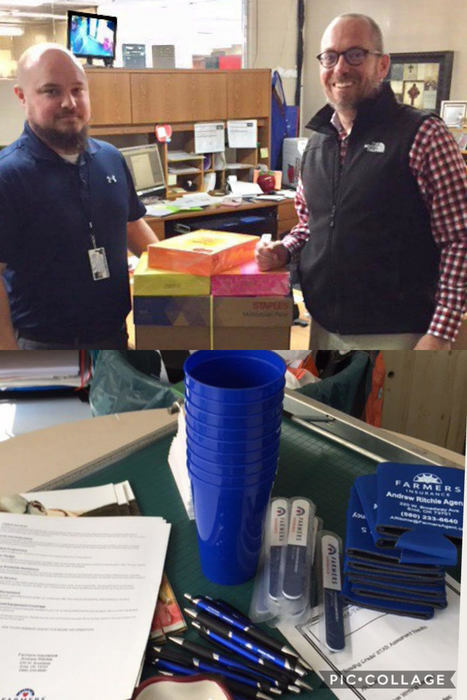 We would also like to thank everyone for the support that has been shown to our school staff from the community. We will send out more information as it becomes available. Once again thank you and it’s a great day to be a CHIEF! Patrons of the Waukomis Community, I am sorry for the inconvenience but due to an increase number of teacher and staff absences reported for Tuesday April 3rd, a decision has been made to cancel school for tomorrow. 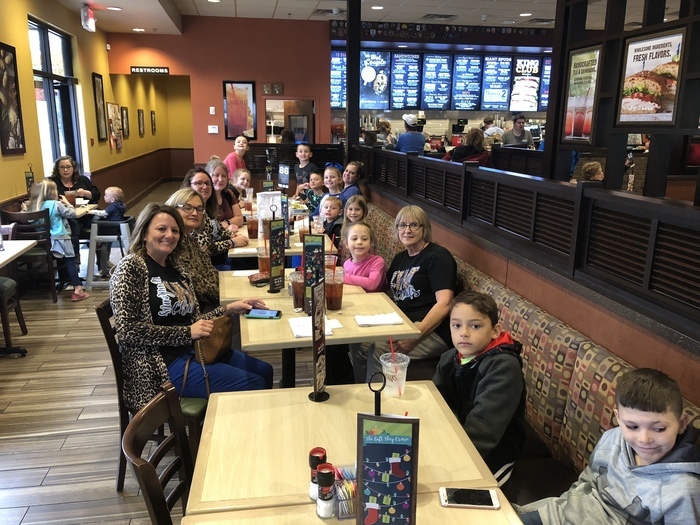 Our teachers are working hard to gain support from our legislators and make true changes that are needed to help fund your child’s education. While this is not the ideal situation I can only ask for your continuing support for our teachers and staff members. Waukomis High school will still be providing the ACT to all juniors at 8:00 am. More information will be sent out tomorrow as it becomes available. Waukomis Public Schools will be in session Tuesday April 3rd. We thank you for your support of our advocacy day today. We will not be 100%, staffed we will have some teachers representing our school district for our students at the capitol throughout this week. We will have class like normal though. Once again thank you for all of your support during this time, and it’s a great day to be a CHIEF! All Softball games have been canceled for today April 2 nd. 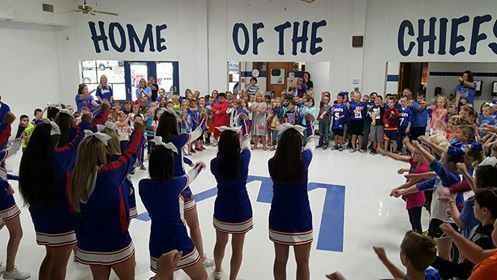 The governor did sign the current budget bills for education last night, but as of now the staff at Waukomis Public School feels it is appropriate to take an advocacy day Monday April 2nd to go to the capitol and have Waukomis student's voices heard. There will be no school on April 2nd. We are still in discussions about the following days after the 2nd. Please continue to check the Waukomis app and listen to all calls for information. Thank you for your support! Its a great day to be a Chief! Thank you for your support of book the fair. 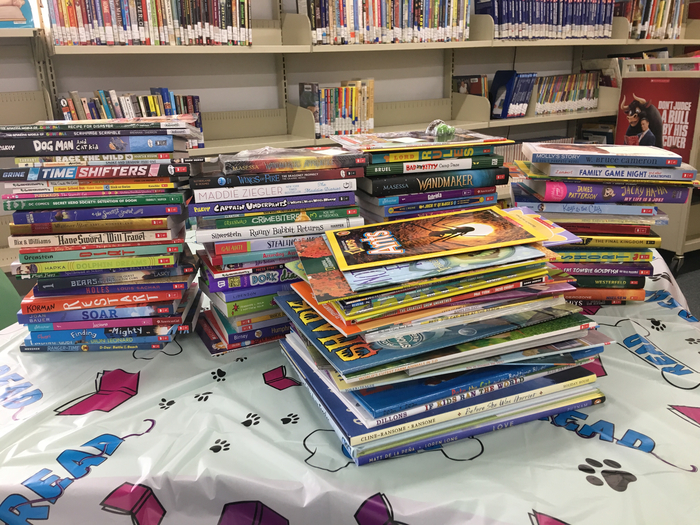 Because of your $ spent, we get to keep this many free books for our library. 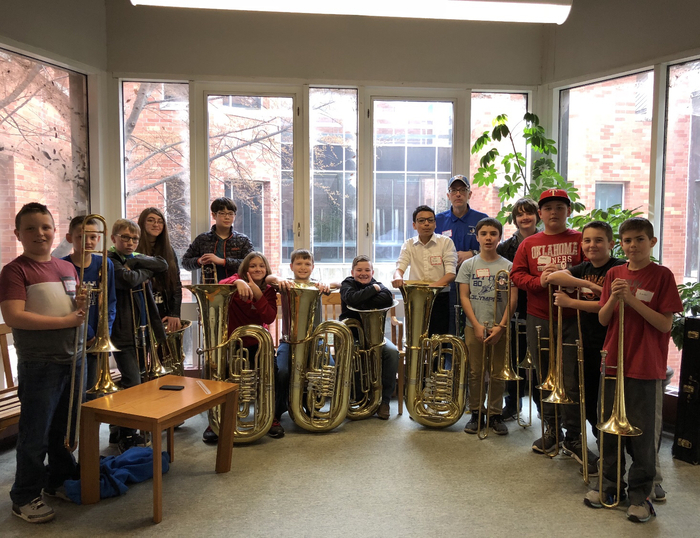 Waukomis Band receives straight ones today. 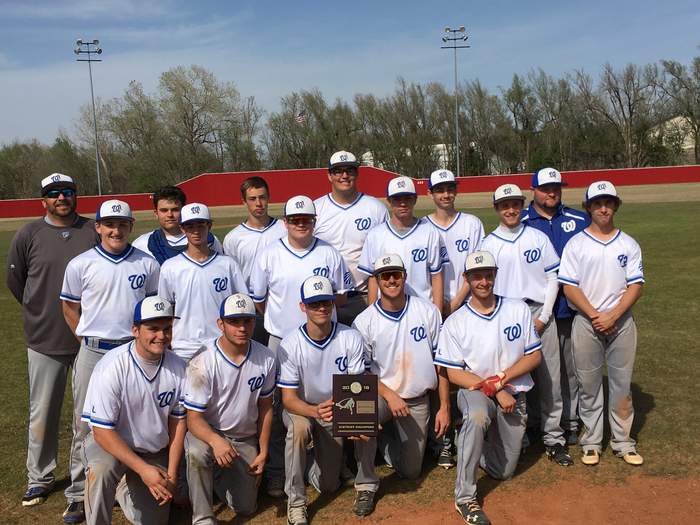 They are State Bound now! Good evening, Waukomis Public Schools will be closed tomorrow February 22 due to inclement weather. Stay warm and be safe. 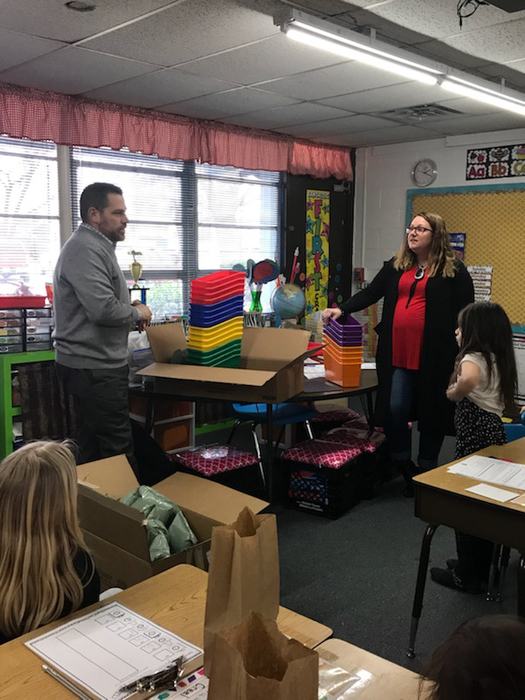 Mike Stuber delivered supplies that Mrs. Burt won in a $100 drawing for teachers through Mike Stuber Insurance Agency. Good job to Seniors Trenton Terrel and Danaka Thrower for qualifying to receive their State FFA Degrees! They will be recognized on stage at State FFA Convention in May! Congratulations to Kaylee Heisler for making the Social Media Team at the Northwest District Junior Livestock Show! 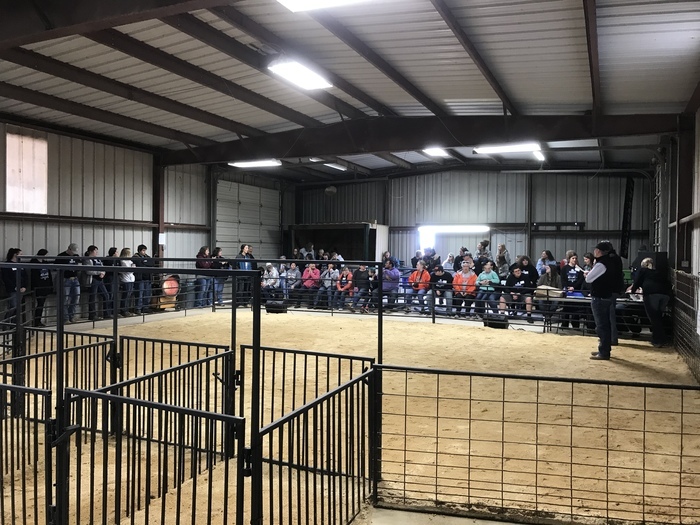 1st annual Waukomis Special Needs Livestock Show is underway. Come out to the show barn. 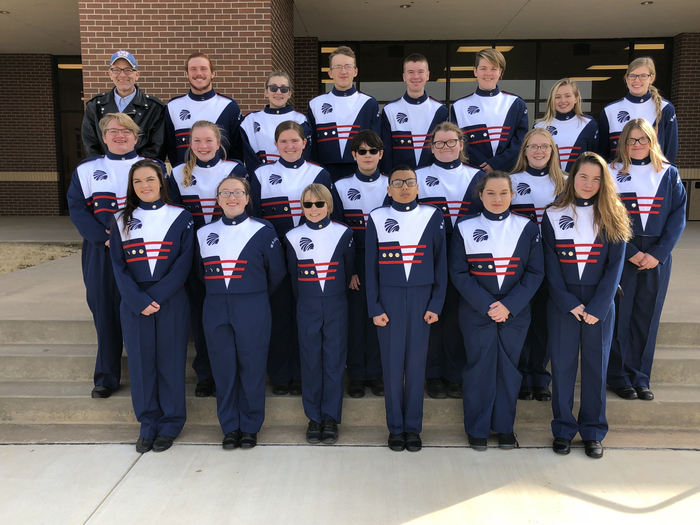 New band uniforms being used for the first time for honor band. 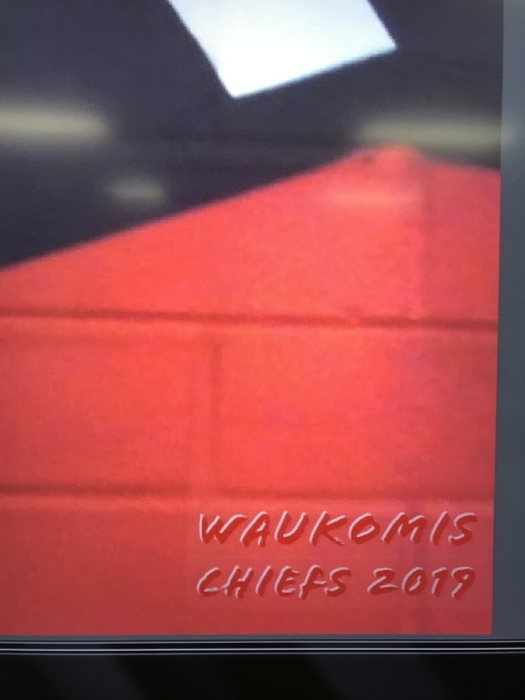 Sharp looking Chiefs! 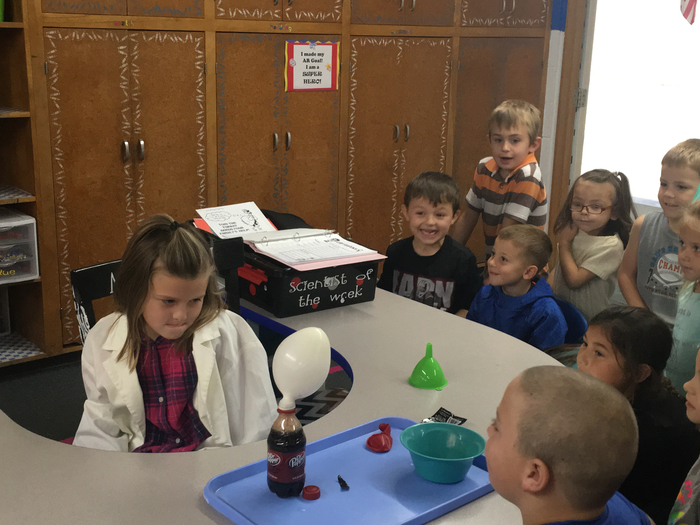 Kindergarten Scientist of the Week!!! Spirit day starts early around here! Ball games tonight, pep assembly today, and learning all day! It's a great day to be a Chief!